Hello friends! I hope you had a good weekend. Apparently I did because I was up before 7 today and I’m using exclamation points within the first paragraph. Mind you, it’s Monday so this is incredible. I truly believe there is nothing a little weekend and a lot of coffee can’t fix. I’ve been seeing off the shoulder everywhere and wanted to try the style out. I decided to go with two options for summer: a white crisp silhouette and this simple black version, which actually feels / fits like a tee. This trend caught me by surprise this season but now I’m such a fan of this look. Perhaps it’s because I am a child of the 80s / 90s and I had a few Barbies with similar tops and dresses. No, not perhaps — that’s actually 100% why. I’m also waiting for the color peach to come back in a big way, too. Fingers crossed for next spring. Love the off-shoulder top, you look lovely!! SO PRETTY! I love this on you. And I like that this top doesn’t have the weird spaghetti straps on the shoulders. I like the off the shoulder tops better without. What size are you wearing in the top? Thanks! Loving this off the shoulder look on you!!! Exclamation points abound! Beautiful and feminine outfit! You look gorgeous! I love this outfit! Pairing the off the shoulder shirt with a bit of a longer skirt is a great idea too because then they balance each other! Gorgeous! So soft and sweet pieces! Love it! this is a gooooood good look on you, girlfriend. I’m all about the off the shoulder tops for this season, too. This one is so cute with that skirt! Beautiful! So elegant and streamlined. Love the silhouette and the flowing skirt. I love this look! That skirt is stunning! 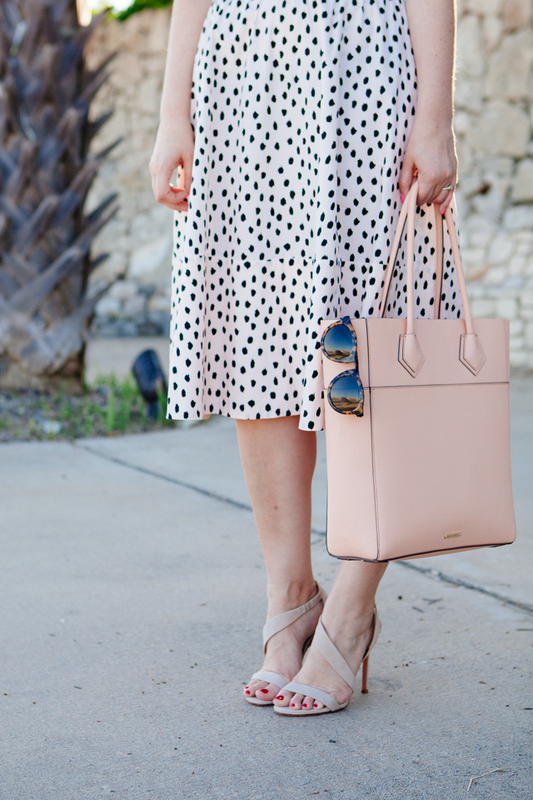 This is so pretty & feminine – love the pairing! You look gorgeous!! 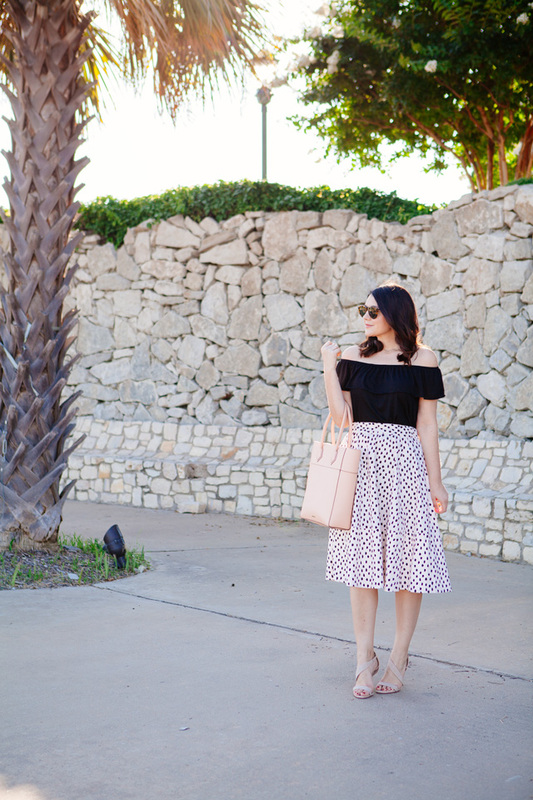 You make the off-the-shoulder trend so ladylike! Last time I wore something off the shoulder (a red sweater, to be exact), I caught the eye of my now-husband, so I know this look has some serious power to it. 🙂 You look gorgeous! Love the modern take on a very Audrey Hepburn look. 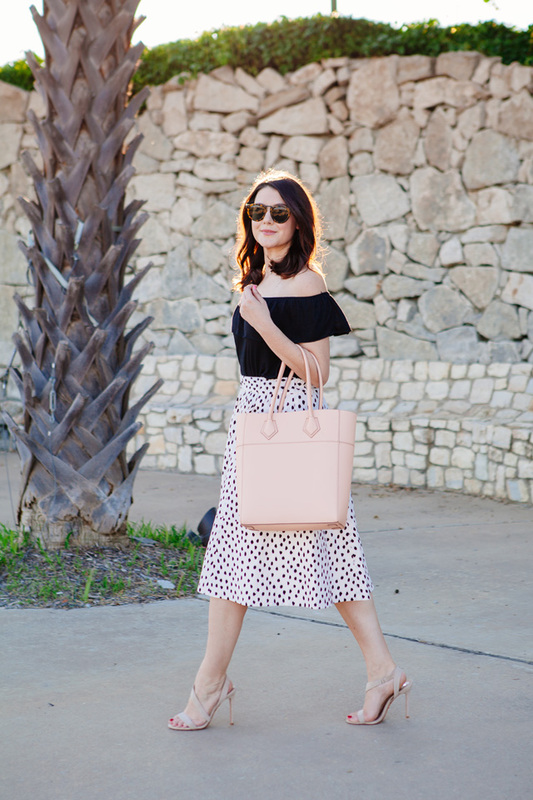 This skirt print is perfection! Tough love: The second to last picture is stunning. You are SOOOO truly beautiful when you aren’t making prune face and your clothes fit. SO PRETTY! I love this on you. And I like that this top doesn't have the weird spaghetti straps on the shoulders. I like the off the shoulder tops better without. I love the off the shoulder top! I’ve been on the hunt for one but I can’t wait to add it to my closet. Also, totally agree with you on the color peach. It needs to happen. Agreed! Been seeing off the shoulder everywhere! I just wrote about it today, haha. Def a summer trend, so many of which have a 70’s-ish kind of vibe. So fun! That last photo is stunning Kendi! You look gorgeous! I'm all about the off the shoulder tops for this season, too. This one is so cute with that skirt! 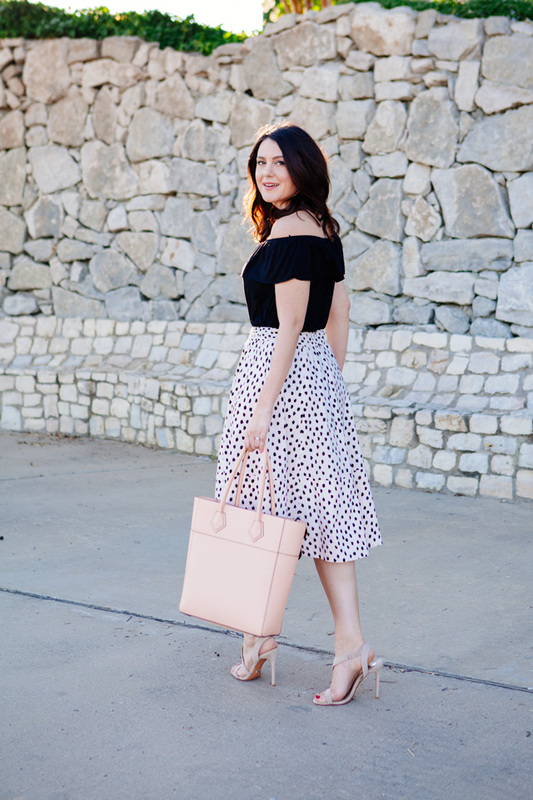 Loving this feminine look! I too have been into all the off the shoulder looks for summer! I’m becoming obsessed with off the shoulder tops too! The one you have sounds like it’s super comfy! Such a pretty look. Very feminine, poetic with a nod to yesteryear. Second to last picture is stunning. You are SOOOO truly beautiful when you aren't making prune face and your clothes fit. Love this off the shoulder top — gorgeous style! Agreed! Been seeing off the shoulder everywhere! I just wrote about it today, haha. Def a summer trend, so many of which have a 70's-ish kind of vibe. So fun! I definitely need more off the shoulder dress. You look so great in these styles/silhouettes. Those shoes are amazing! I love this off the shoulder look! It’s so pretty! I'm becoming obsessed with off the shoulder tops too! The one you have sounds like it's super comfy! Love this pretty off-the-shoulder look, very feminine and classy! Definitely a style I will wear myself too, awesome! I love this off the shoulder look! It's so pretty! Such a classic, vintage look. Love it! Oh Kendi, you did it again! Love Love Love! this is really darling and summery! Nailed it! You look stunning. I want this look for me. It’s so elegant, so feminine. This is going to be my look for this summer. Thanks for the idea. By the way this look has a very ” Italian holiday ” feel to it. This outfit is smashing!! I love this pairing so much. I want this look for me. It's so elegant, so feminine. This is going to be my look for this summer. Thanks for the idea. By the way this look has a very Italina holiday feel to it. Lol I had peaches & cream barbie too! Totally want it to come back! Beautiful. Wow that skort, and those heels, just perfect! Lovely outfit! The bag is nice. Lovely outfit! The bag is so nice. That top is super cute! Love it paired with that skirt! Do you do anything to keep the top in place on your arms? I’m debating about keeping this because whenever I raise my arms even a little, it slips up onto my shoulders!